​The People's Republic of China (PRC) - is currently undergoing a process of great change and accelerated development that extends to its military and its aeronautical output...and surely the past six years have confirmed this emphatically. Since President Zi gained power as General Secretary of the Communist Party, Chairman of the Communist Party of China (CPC), Central Military Commission and was elected President of the People's Republic of China, the speed of these developments has increased further. Continued economic reforms with stricter rules for strengthening the legal institutions on the one side and an emphasis on individual and national aspirations under the slogan "Chinese Dream" on the other are characteristic of China's current rise. President Xi Kinping has initiated a more assertive foreign policy, particularly in regard to Japan, the US and, most noticeably to its claims in globalization, by which it seeks to expand through the "One Belt, One Road Initiative". Many in the west fear that in the long term, China' ambitions will further fuel competition with the US as a world power, with the goal of equaling or even surpassing them. Consequently, China's economic development has been matched by rising political ambitions with the aim of returning the country to a central role in regional and global affairs. It is therefore considered vital for China to demonstrate a military presence in its area of influence. In the past decade, China's military has undergone some of the most profound reforms and improvements since its establishment and the Chinese Navy and is air arm are playing an increasingly important role in achieving these goals. This book covers these things quite well. Harpia is based in Houston, TX. The book was printed in the Czech Republic. I cannot identify what that aircraft is or any of the 3 color side views of aircraft on the back cover...sorry. It is soft cover of 96 pages in 8 1/4" x 11" page format. It came shrink-wrapped in clear cello. It contains 91 color photos. Most of these are very small and almost microscopic in some cases. 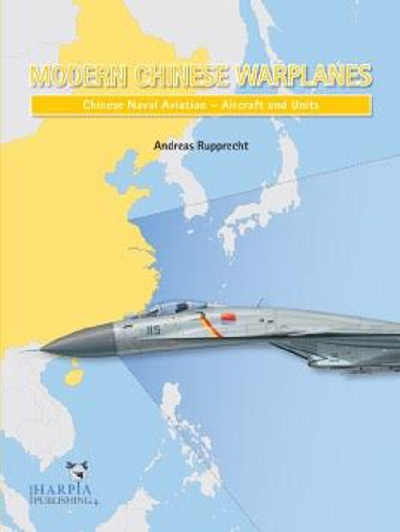 The cover art shows the side of a jet fighter flying over a map of China. There are 6 color maps included, 14 color illustrations of squadron insignia, 19 data lists, a bibliography. On the last 2 pages there are cover arts of other Harpia books: "Scramble World Airline Fleets 1018", EMB-314 Super Tacano" and "Iraq Air Power Reborn". This book will be of interest to aviation enthusiasts and modelers alike. I want to thank the folks at Casemate Publishing, the North American distributor of Harpia for this review sample and Harpia too.